1. 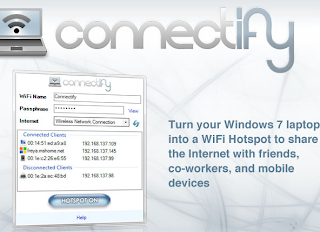 Download Connectify Software for your PC. 2. Now after you have downloaded it, just install it in a normal way and after successful installation you will be promoted to Reboot your computer do that its important. 3. Now after Reboot it will automatically start and show window like in the image above, just change the name if you want too and add a 8 digits password. 4. 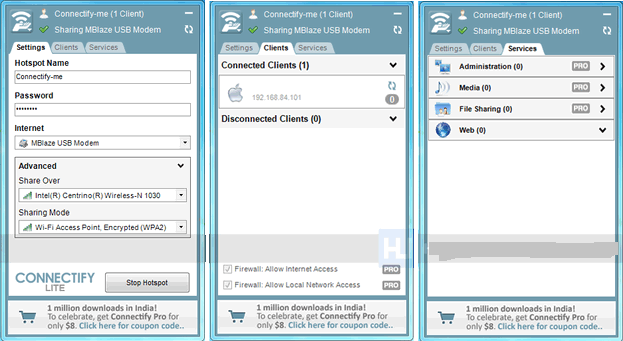 Now choose the internet connection you wanna share I am sharing my MTS 3G Dongle internet connection with my iPhone. able connection and you will see the above name you have mentioned dis playing just hit that and enter the 8 digits password you kept. second window in the above image, that’s just for keeping track on people using your Wi-Fi connection. 1) Create a wi-fi hotspot from your pc/laptop in an instant. 2) Created hotspots require WPA passphrases for better security. 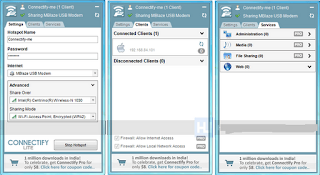 3) Connect and sync your wi-fi enabled devices without using cords, blue tooth, or wireless router. 4) Works with Windows 7 (only). to this. Keep Contact with us.